Ack! The crackling of knuckles and the popping of tendons! I have not typed in over a week because I was on vacation and thus took eight days off from WordPress, Twitter, Facebook – all that cyberstuff. I even went without e-mail! (Doncha just love wading through all the accumulated spam and mail after a long break…) Anyway, I’ve only been home for a few hours and simply could not stay away from the computer for much longer. I’m not going to type out a long treatise about my trip – well, not yet, anyway – but I really did want to get my feet wet again. So I tweeted, and now I’m blogging a bit. Little by little, things will get back toward normal. And my fingers will loosen up; they actually hurt now! Yikes! I have a friend who types about 80 words a minute, while I clock in more around eight words per minute (which causes her no end of dismay). I had lately been boosting my skillz to around 12 or maybe even 14 words a minute! But now, these rickety old joints have stiffened, and I feel like I’m back to the single digits. Ow! 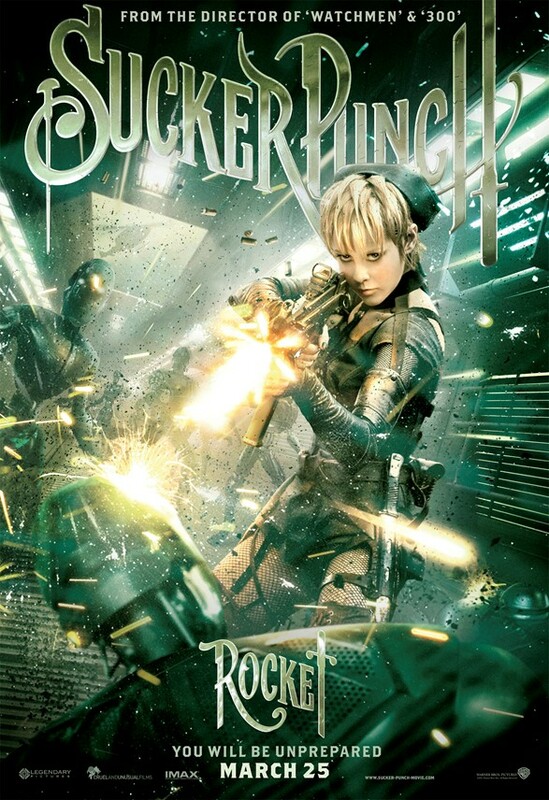 Sucker Punch, directed by 300 and Watchmen auteur Zack Snyder and starring Emily Browning, Jena Malone, Vanessa Hudgens, Jamie Chung and Abbie Cornish, will be released March 25. (BTW, that music is Panic Switch by﻿ Silversun Pickups. DOCTOR WHO at a glance! 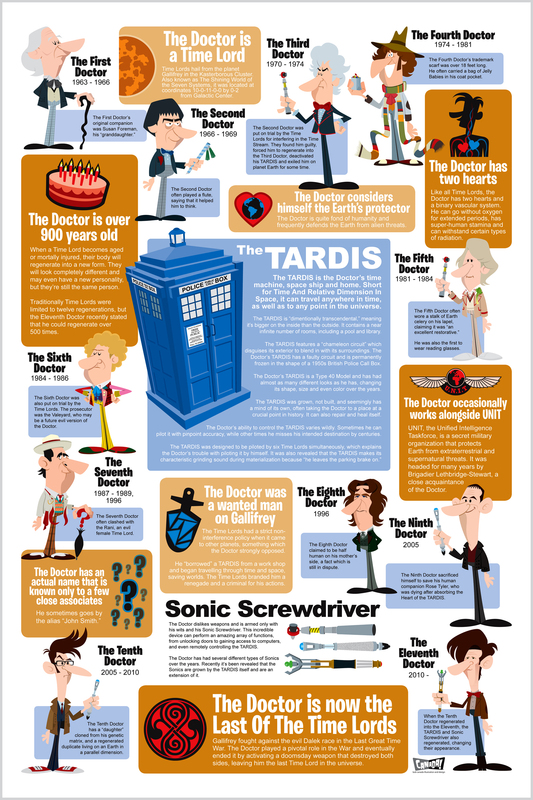 Pretty much everything you need to know to start watching DOCTOR WHO, you can glean from this infographic created by artist Bob Canada. Sure, it’s simplified, but the point is to get noobs up to speed ASAP. Plus, it’s a nice piece of artwork. For a lot of Americans, the Super Bowl is the one time of year we actually want to pay attention to commercials. Some years, it feels like the game gets in the way of the real entertainment. But the 2011 game was a tight contest between the Green Bay Packers and the Pittsburgh Steelers, with the Pack pulling out a 31-25 nail-biter. 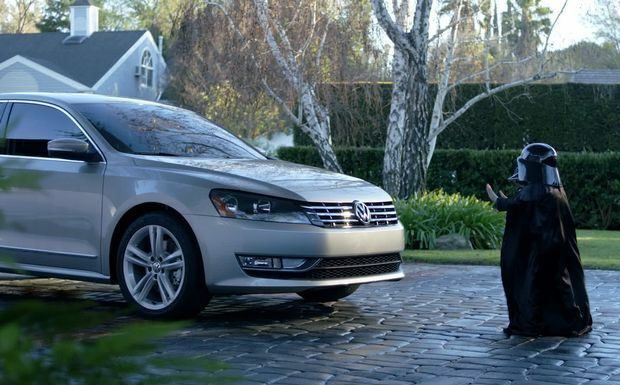 The best spot, far and away, was “Volkswagen: The Force,” featuring the kid dressed as Darth Vader. Coming in second for me was, “Pepsi Max: Love Hurts,” featuring the woman torturing her husband and, ultimately, knocking out another woman by braining her with a can of Pepsi Max. The “NFL Best Fans Ever” spot worked, even if it was a bit heavy on characters younger viewers might never have even heard of. “Doritos: House Sitting” was funny, and the trailers for Captain America: The First Avenger and Thor looked quite good (Thor vs. the Destroyer? I’m there!). “Coke: Border” was nice, if simplistic. With the New York Giants not even making the NFL playoffs this season, I have no stake in this year’s Super Bowl between the Green Bay Packers and the Pittsburgh Steelers. Neither team means much to me; I guess I could talk myself into rooting for the old-school NFC Packers, but the Steelers have a lot of tradition, too. However, I don’t really care. That’s why I feel detached enough to have a little fun with the Big Game, and share this tongue-in-cheek PSA from the stars of HELLCATS, the college cheerleader drama starring Aly Michalka and Ashley Tisdale that airs Tuesdays at 9 o’clock on The CW. Somehow, I think the Super Bowl will find a way to muddle on without cheerleaders, but the spot is fun, and HELLCATS actually has more going for it than you might suspect. Yep, that’s Torchwood 3’s Gwen and Rhys confronting PC Andy in TORCHWOOD: MIRACLE DAY! 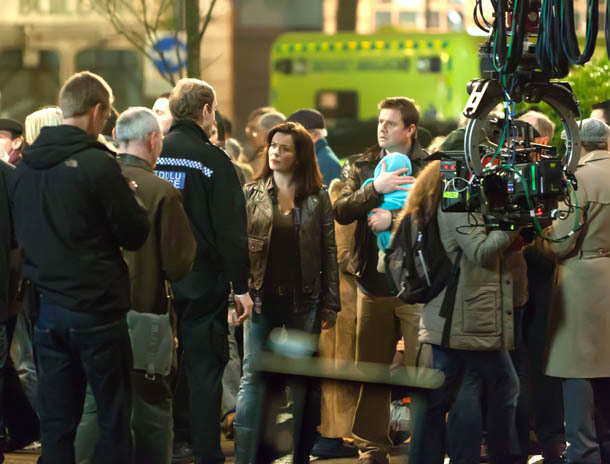 SFX is the place to see 10 behind-the-scenes pics from filming of the fourth TORCHWOOD series. They feature John Barrowman as Captain Jack, Eve Myles as Gwen, Kai Owen as Rhys, Mekhi Phifer as Rex and Tom Price as PC Andy. T:MD is filming in the United States and Wales concurrently, and set to premiere on July 1 in both the USA on Starz and BBC1 in the UK. Well, here it is, the first real teaser poster for Captain America: The First Avenger. I have to admit I mostly like it. 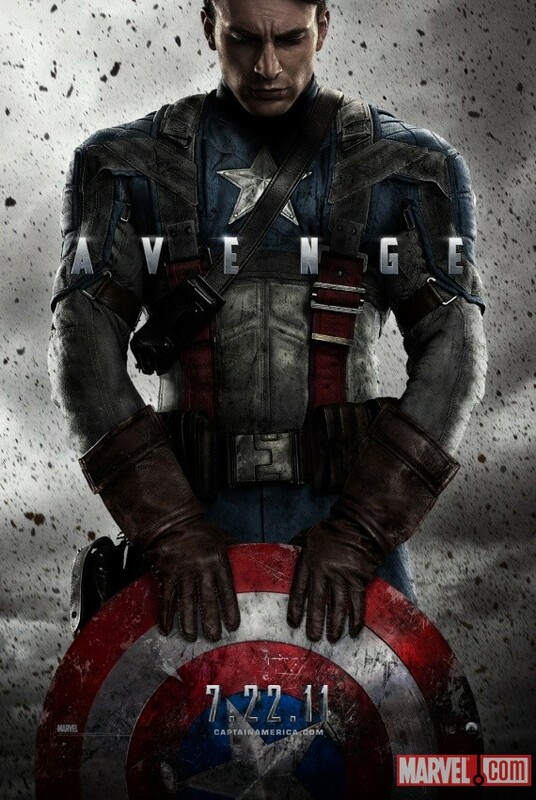 I could totally live without the word “Avenge” spread across Cap’s chest, but the rest of the image is great. I like the way Cap is depicted as weary and battle-scarred, as if World War II has taken a lot out of him. The flying debris in the background makes this look like a candid shot of Cap in a moment of human vulnerability. I figure this is not the moment when he vows vengeance for the death of Bucky, because (according to comics lore) Cap doesn’t find out that Bucky died until after he was defrosted by the Avengers. This is probably meant to be a figurative moment: a battle-hardened Steve Rogers (Chris Evans), haunted by the traumatic memories of WWII. 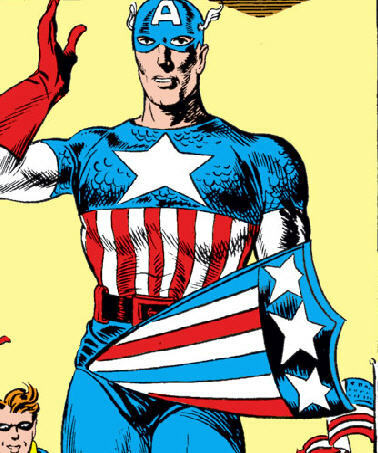 I’m still not a fan of depicting the star-spangled Avenger’s shield as damaged. It’s supposed to be completely impervious. And word is the shield in the movie is made of vibranium, just like in the comics. But this one is pretty much beat to hell. Still, artistic license, and all that. And maybe this isn’t his vibranium shield at all; maybe it’s one of the other shields he used before the fancy one was presented to him by President Franklin D. Roosevelt.